At the Bay Delta's Steamboat Slough. My photographer and I ventured into the Delta region to go to the heart of the fight over who can claim rights to water in California during the worst drought in the state’s history. The river towns we passed through—Courtland, Isleton, Rio Vista—don’t much resemble the labyrinthine delta that nearly devoured explorer John C. Fremont’s men in the mid-19th Century. The Bay Delta’s source waters—the Sacramento and San Joaquin rivers—are dammed and diverted, its sloughs crisscrossed with drawbridges, and its marshes drained and planted with orchards and vineyards. Yet the Bay Delta, the largest estuary on the west coast of the Americas, still retains a wildness to its character, serving as home to hundreds of species of plants and animals; some, like the Delta smelt, found nowhere else on Earth. We were hunting for stories about the people who would be directly impacted by aRepublican-backed House plan to pump massive amounts of freshwater out of the Delta to farms in the southern Central Valley. The bill, whitewashed as a drought relief plan, favors the powerful and heavily subsidized agriculture sector—which already consumes 80 percent of the state’s water supply—while throwing out environmental protections, sacrificing wildlife, imperiling local economies and potentially jeopardizing the drinking water supply of many Northern Californians. While the legislation has little chance of making it out of the House (the Senate has responded with a more reasonable water sharing bill which has the support of President Barack Obama), California Gov. Jerry Brown is pitching a costly and contentious plan to build tunnels underneath the Delta to siphon water from the Sacramento River directly to those same farms, further compromising the fragile ecosystem of the great estuary. Big money speaks in the sunny Central Valley where mega cash crops like almonds and pistachios—thirsty perennials that can’t survive without rivers of water—have been planted in the middle of a near-desert. A world away from the scorched empty field where House Speaker John Boehner (R-OH) decried the drought as a “man-made” catastrophe brought on by environmentalists who favor fish over people, lives Brett Baker, a pear farmer in the northern Delta. At 30-years-old, with a wife and a baby and a second one on the way, Baker and his family are some of the many people Boehner happened to overlook. Baker greets us outside his ranch house and leads us across the road to the top of the levee that overlooks Steamboat Slough, a quiet canal that used to see steamships regularly pass along on the shortest water route between Sacramento and San Francisco. 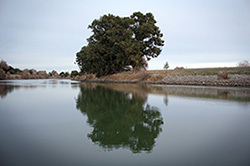 Baker studied fish and conservation biology at UC Davis, but as a member of the seventh generation to farm this land, he speaks not as an academic but with the deliberate ease of someone who knows the character of the waterways from a childhood spent swimming, fishing and watching the boats pass by with the rising and receding tides. The Delta’s ecosystem has already been heavily taxed by decades of pollution and water exports to places like the Central Valley. Over the course of his short lifetime, Baker reckons he’s already witnessed decline in the native species of the region due to mismanagement of water. Rather than steal water from the Delta and renege on responsibilities to protect endangered salmon species, Baker believes California water officials should use the drought as an opportunity to design better management plans that don’t throw legacy environmental protections such as the Endangered Species Act out the window. He isn’t alone with that idea. If you could stop the erosion of environmental protections on behalf of big corporate interests anywhere, it would be in the environmentally minded Golden State, Baker contends. “The Endangered Species Act has been around for 40 years, and I think it’s just absurd that California could be the place where it would just disintegrate,” he says. Baker’s modest 30-acre plot is a tiny piece of Delta farming, which is the dominant use of the region’s land accounting for $795 million in revenues in 2009. Baker says plans like the House-sponsored bill or Gov. Brown’s Twin Tunnel proposal would not only erode the ecosystem, it would destroy an entire way of life. “There are a lot of small family farms around here. If you look at the average holdings of the people who farm in the Delta, they are not multi-million dollar growers. They are families,” he said. 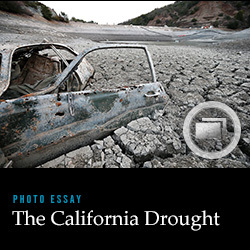 To hear more of the stories about the people who’d be left high and dry by a massive water grab, check out our photo essay on the California drought.